From a single device TidGen™ Power System to an array consisting of a 3-device power system. Phase 1 – A single-device TidGen™ Power System with a rated capacity of 150 kW was secured to a bottom support frame, which was attached to the seafloor. Subsea power and data cables were deployed on the seafloor and connected to the TidGen™ device. Electricity generated by the TidGen™ Power System was delivered by an underwater power cable to an On-shore Station in Lubec, Maine, where it was power-conditioned and connected to the Bangor Hydro Electric Company (BHE) utility grid on September 13, 2012. Phase 2 – Two additional devices with a rated capacity of 150 kW will be added to form a commercial-scale, multi-device power system. The underwater power and control cables from the turbine devices will be connected to an underwater consolidation box, and a single underwater power and control cable will connect this box to an electrical substation onshore. The complete system will be interconnected to the BHE grid. The device is located in Cobscook Bay on State of Maine submerged lands, near Eastport and Lubec, Maine, United States. The installation and start-up of the single-device TidGen™ Power System (Phase 1) is 100% complete. This is first grid-connected marine hydrokinetic project in the Western Hemisphere. It has received a 20-year Power Purchase Agreement from the Maine Public Utilities Commission. Detailed testing and monitoring of the nearby environment, as well as all device components and subsystems and initial operations is ongoing. Engineering enhancements for the multi-device power system has begun. The single-device TidGen™ Power System began operation on September 13, 2012. Completion of the construction, installation, and deployment of the Cobscook Bay Tidal Energy Project is scheduled for late 2013 to early 2014. In addition, as required by ORPC’s FERC License, an Adaptive Management Plan has been implemented that describes and manages the process for evaluating environmental monitoring data and license modifications where appropriate. The Adaptive Management Team is comprised of the jurisdictional federal and state agencies and ORPC. Federally listed threatened and endangered species with potential to occur in proposed project area (Source: application, as modified by FERC staff). 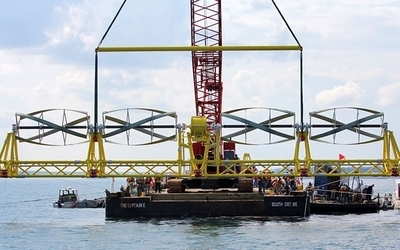 Cobscook Bay Tidal Energy Project is located in United States of America. Studies conducted in development of DLA. Detailed bathymetric mapping, side-scan sonar, sub-bottom profiling and magnetometer surveys. Data used to characterize the bottom and identify potential cultural resources and marine hazards. Preliminary results led ORPC to change deployment strategy of turbines in Cobscook Bay primarily due to thickness of unconsolidated sediments. Acoustic Doppler Current Profiler (ADCP) surveys. Hydraulic circulation modeling. ADCP surveys and hydraulic modeling contributed to the selection of turbine deployment locations. Drifting Noise Measurement System (DNMS) at project site and around ORPC’s beta turbine. Beta turbine operation did not elevate underwater sound levels more than 10 dB above ambient levels and is not expected to cause harassment to marine mammals. Marine mammal presence and interactions. Incidental visual observations; testing of active acoustic monitoring (AAM) system. Visual observations recorded primarily harbor seals at the project site; AAM testing indicated positive results for detecting and tracking marine mammal sized targets. Fisheries presence and turbine interactions. Hydroacoustic and trawl surveys of project and control sites; interaction studies around ORPC’s beta turbine. Hydroacoustic and trawls surveys combined to detail fisheries presence (seasonality, vertical distribution, diurnal patterns, etc.) and speciation. Interaction studies demonstrated fish behavior. Species presence, behavior, and seasonality documented. Benthic dive survey of deployment area and cable route. Species presence and distribution documented. Measurements made following Phase I and II installations by drifting noise measurement system (DNMS). Pre-deployment studies indicated water temperature variations from the project would be insignificant. ADCP measurements made following Phase I and II installation, hydraulic circulation modeling to be modified based on measurements made in the field. Benthic and Biofouling Monitoring Plan. within project area and evaluate potential project effects on them. Determine if project structures have potential to allow biofouling accumulation that may alter the habitat within the deployment areas. Examine the recovery of benthic resources disturbed during the construction of the project. Incidental observations; dedicated observers and hydroacoustic monitoring for Phase I pile driving. Sea and Shorebird Monitoring Plan. Establishes team, process for evaluating environmental monitoring data and license modification.